Produced by the well-known and trusted company Friedrich, which was founded in 1883, this 10,000 Btu air conditioner is best suited to a room of about 450 square feet. Not only does it create crisp, cool living conditions, it is equally effective as a heater with its 3.5 kW electric heat. Energy efficiency is a defining characteristic of this unit, guaranteeing the user big savings and reduced impact on the environment with use. The 24-hour timer allows you to program in your preferred times for the air conditioner to turn on and off. Meanwhile, the Money Saver function reduces further energy use by operating the fan only during periods of cooling. Auto restart means that users are saved from the hassle of manually restarting the unit after power outages. Its washable antibacterial air filter makes it easy to keep this air conditioner producing cool, clean air for years to come (and has a â€œcheck filterâ€ reminder so users will not forget). There are three different cooling speeds, as well as a fan-only setting on days of milder weather; plus, six-way control of airflow allows air to be directed anywhere in the room. Corrosion protection offers resistance to corrosive damage, and defrost control is useful when temperatures get very low. It fits well into the decor of virtually all rooms. The coloring of the chassis is simple, neutral, and muted, and it can be installed entirely flush with an exterior wall. The universal fit trim ring covers gaps measuring up to 1 inch on the sides and half an inch on the top and keeps the overall look of the unit minimal and attractive. With Uni-Fit, this air conditioner can easily be fit to wall sleeves measuring between 24.5 inches and 27 inches. 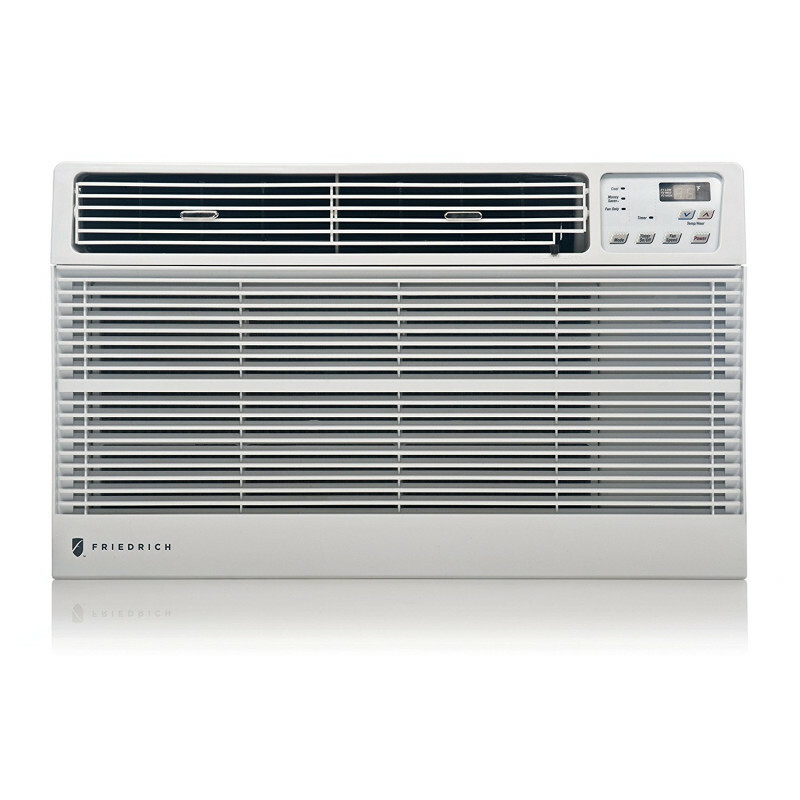 Use of this unit means years of effective, trouble-free cooling at a low cost.